Heart disease is the becoming the leading cause of death in both men and women worldwide. Many of us know heart disease is serious. Those who have the disease can lower the risk of death, bypass surgery or angioplasty, by lowering their cholesterol and blood pressure levels. 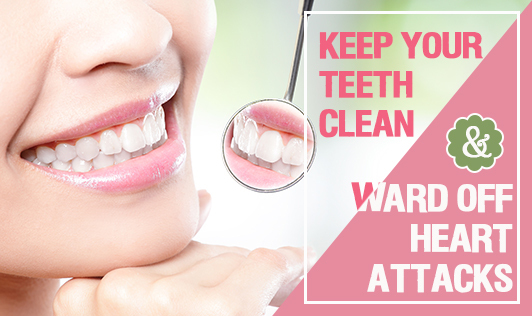 However, there is another lesser known way to ward off a heart attack: by keeping your teeth clean! In the last few years there has been increased research to establish the links between heart problems and gum disease. According to a new study, if you don't brush your teeth twice a day, you're more likely to develop heart disease. It may seem a little strange that poor oral hygiene may hinder heart health, but there seems to be a direct correlation between oral health and heart disease. Poor oral hygiene leads to gum disease, which may turn into inflammation, a contributor to heart disease. Researchers found elevated signs of inflammation in individuals who did not brush regularly, mainly C-reactive protein. C-reactive protein (CRP) is a protein that rises in the blood in response to inflammation throughout the body. But researchers also say that future experimental studies will be needed to confirm whether the observed association between oral health behaviour and cardio vascular disease is causal or a risk marker. • Brush your teeth twice a day. • Hold the tooth brush tilted at an angle of 45 degrees towards your gums. • Clean the upper teeth first, use back and forth motion. • Brush 3 teeth at a time, making your way around your whole mouth. • Brush the gums gently to remove lodged food particles and bacteria. • Brush the tongue gently.